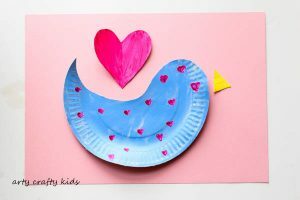 It’s the season of LOVE and we’re getting our Valentine’s craft on with these adorable paper plate love birds. 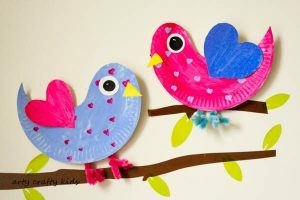 They are so easy to make and kids can get really creative with their designs; adding colour and patterns to make their love birds stand out from the flock. Using a single paper plate and a handy template, it’s the perfect craft for a group session or at home. 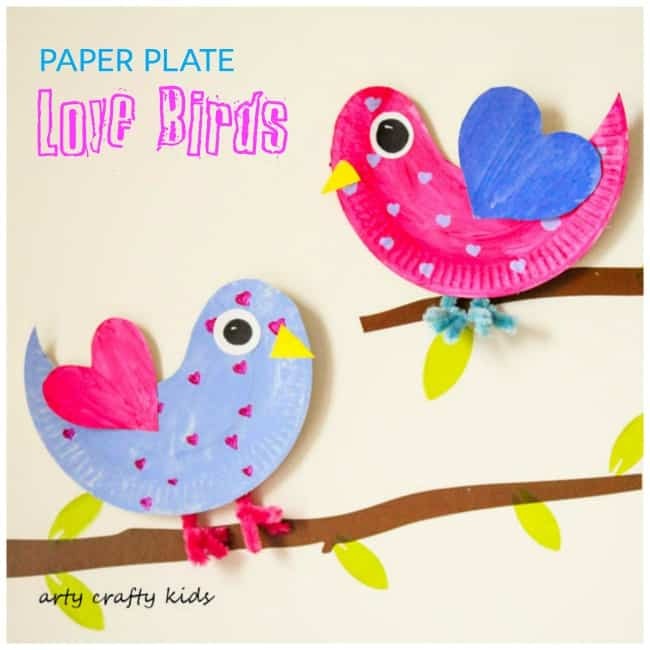 Love Bird Template – Available to download within the Arty Crafty Kids Club! Step 2: Cut the paper plate in half creating a ying-yang shape. Step 3: Paint the love birds opposite colours. Step 4: Cut out the heart shapes wings from the template. Either colour them in using pencils or paint, OR the use the shapes to trace around coloured construction paper. Step 5: Fold the hearts back and forth (as shown in the video) to create a textured zig-zag surface. 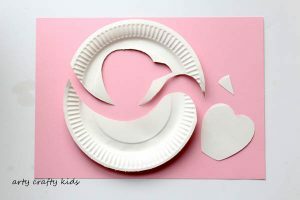 Step 6: Attach the paper heart to the paper plate love bird. Step 7: Complete with an eye and beak! The Arty Crafty Kids Club! Perfect for Parents and Educators! Includes Art & Craft Templates, Colouring Pages, How-to Draw Guides and Activity Booklets! Everything an Arty Crafty Kid needs in ONE place! Step 1: Cut the Paper Plate in half creating a ying-yang shape. Using the remainder of the plate, cut out a heart and beak shape. 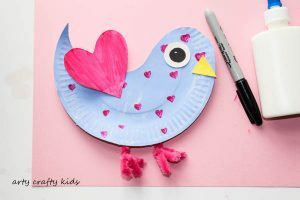 Step 2: Next, paint the bird – get creative use lots of colours and make a pretty pattern. Step 3: Using PVA glue, attach the wing and beak. 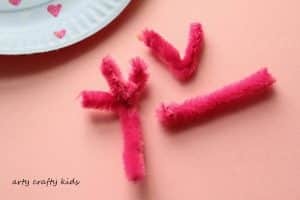 Step 4: If you have pipe cleaners to hand – excellent, otherwise I wouldn’t worry as I consider them to be an optional extra! You will need one pipe cleaner cut in two. Bend one piece into a V shape and leave the other slightly longer piece straight. Simply place the long pipe cleaner into the centre of the V, align and twist in the middle. Using some sticky tape, attach the legs to the back of the paper plate. Step 5: To finish off, add a black pupil to the circle and glue to the head of the love bird. 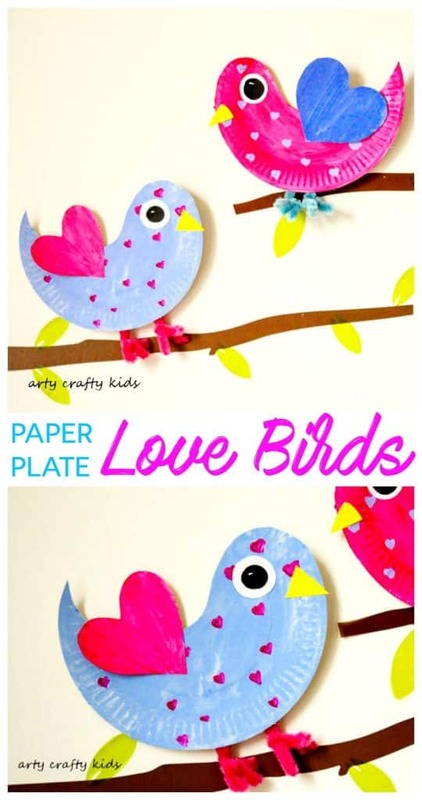 Ta-da, you should now have a super cute paper plate love bird! And since love birds always come in pairs, why not make another? 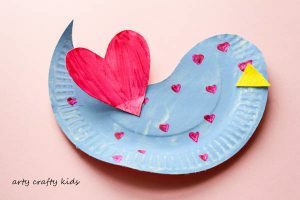 For more Valentine’s inspiration check out our Handprint Valentine Tree, Paper Plate Heart Hat or for some super duper messy fun, take a look at how we set up a messy heart painting session.